Every Day Ab Routine was posted on May 14th, 2012 and is filed under Fitness, Weight Loss, Workouts. This entry has 8 comments. You can follow any responses through the RSS 2.0 Comment Feed. Hello Colourful Palate readers! Nice to meet ya! My name is Carissa. Yes, there are multiple tall, blonde, healthy-minded “Charissa/Carissa” bloggers! Craziness! I’m honored Charissa asked me to guest post. She posted for me last summer when we were on vacation and I’m happy to return the favor. I love her delicious recipes and gorgeous photos! Here’s a little bit about me – my husband and I blog at Fit2Flex. We are both certified personal trainers with a passion for healthy, active living, and clean eating. I am also studying to become a registered dietitian, I work as a race announcer, and I’m a FitFluential Ambassador and runner. Stop on by our blog for workouts, meal plans, fit tips, and recipes. My husband and I live in sunny Orlando, Florida. You could argue that here it’s always “swimsuit season”. It was 90 this Christmas! However, some places still spend several months a year bundled up…if you abs aren’t quite ready for a swimsuit don’t worry. We’ve created an every day ab routine for all of you Colourful Palate readers. It’s important to remember that ABS ARE MADE IN THE KITCHEN! To be brutally honest, no amount of sit-ups will help you have a six-pack if you are hiding it under excess body fat. If you commit to clean, balanced eating and a workout routine that includes cardio, weights, and these ab moves, I am confident that you can approach summer with a flat stomach that makes you feel good. Abdominals are one muscle group that can be worked every day. You can do this routine all the way through if you have the proper equipment. You can also do exercises 1, 3, 5 and home and exercises 2, 4, 6 on days when you are in the gym. The odd numbered exercises are “easier” to do and a good place to start if you are a beginner. I wish you good luck and good eats! Note from Charissa: Thank you Carissa for this great ab workout! I can’t wait to try it! I think it’s so neat that she and her husband both are personal trainers – you can check out her website for more fitness routines! Like Carissa mentioned, I think it’s fun that there are other super-tall bloggers out there..the other day Carissa, Lindsay, and myself were tweeting about it. We’ve totally got a tall girl club formed! Thanks for sharing this and being so awesome! Enjoy the time with your fam! 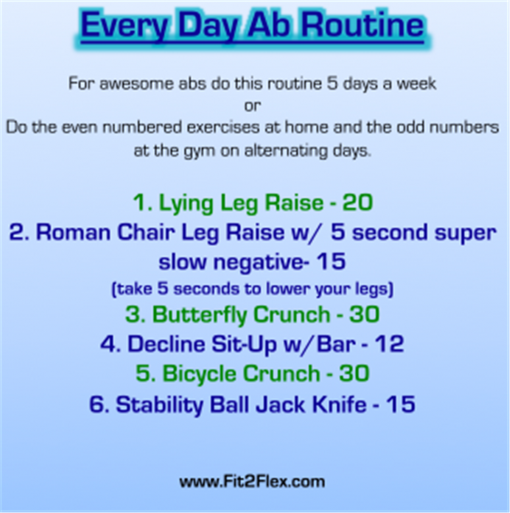 Thanks for sharing this ab routine! I will definitely be putting it to use as the weather heats up! yay for tall bloggers!! great ab workout. Can’t wait to try! Yeah for tall girls! Even though I’m the shortest of the “tall”! I live in Florida too and we are by the water year round’. Thanks for the workout. Looks great! What’s the decline sit up with bar? You do look good together…You inspire me to stick to my routine. Thanks for sharing!